It is more than 180 years since the first zoos opened in Britain. To put that in perspective, the electric telegraph hadn’t been invented, never mind the telephone, and passenger railways had only just come into existence. People rarely travelled far, hardly ever abroad, so imagine their delight when they visited menageries filled with chimpanzees, oryx and orangutans. I can also understand why so many of you today want to take your children to see an elephant or giraffe or gorilla close up. But I think the time has come to re-evaluate the role of zoos. I know it’s not practical to close all zoos today. Nor am I suggesting that all zoos can be closed tomorrow. But I am proposing that we phase them out over the next 20 to 30 years. If you are going to the zoo today, I urge you to look closely. In the wild, these creatures roam hundreds of miles. They hunt their prey, raise their offspring and enjoy complex social relationships. So think how it must feel to be locked up with no stimulation, no room to move and no chance of freedom. Little wonder they develop self-destructive behaviours known as ‘zoochosis’ – repetitively walking in tight circles, rocking, swaying and sometimes mutilating themselves. Watch the lion or the tiger. See if it pads back and forth across its pen . . . back and forth . . . back and forth. Zoos proudly announce millions spent on new enclosures – approximately £130 million has been spent in Europe over the past few years. Imagine the projects they could have funded in the wild for that amount. And nearly all these enclosures are designed for the benefit of the public, not the animals. All too often they are left on permanent display with nowhere to hide. They have no shade, little shelter, no privacy at all. For all the money spent, the life of a zoo animal is no different now from what it was almost two centuries ago. All this suffering, for what? Nothing more than our own amusement. That is hard to stomach. Before I am accused of hypocrisy, let me set out my stall. I'm involved in two wildlife parks in Kent, Howletts and Port Lympne, which have gorillas, rhinos, elephants and other wildlife. The public pay a fee to see them. This money is for the animals’ upkeep and to help fund the Aspinall Foundation, a conservation initiative to return captive-bred animals to the wild. I’m proud we have now bred more captive animals – and reintroduced them to the wild – than any other organisation in the world. Our aim is to get these animals back to the wild and bolster the indigenous populations of endangered species. That is the only reason we breed and keep them. I hope that one day that reason will no longer exist. My greatest achievement would be to close Howletts and Port Lympne for good. Because we are in the countryside we can give our animals more space –- not enough, but it’s an improvement on urban zoos. We also have a strict ethos. The animals come first, not the public. Almost all zoos, I’m afraid, have a different approach. Why else have penguin shows and sea lion hour? How can anybody say that is in the best interest of the animals’ mental welfare? Zoos were first designed as businesses. In the 1960s, as our awareness of animal welfare grew, there was a pressure to improve and modernise. Zoos began breeding programmes to protect endangered species and claimed they were there to encourage children to develop an interest in the natural world. That is blatant nonsense. After all, we manage to teach children about the Greeks and Romans. We should be teaching our children that animals have as much right to live with dignity as we do. By taking them to the zoo we teach them the opposite. Another argument is that zoos are there for everyone – only the rich can afford a safari. I don’t buy that line. Today, we can see life in the wild as never before. We can watch the amber eyes of the hawk and its slow wing beats as it prepares to swoop on its prey. We can watch the lioness, fur bristling, as she scans the savannah for predators, protecting her young. Day in, day out, on television, we can witness these creatures in a way that would have astonished our ancestors. So why are we still resorting to the same form of entertainment they had nearly 200 years ago? Nowadays, zoos say they are in the business of conservation. In my opinion, that’s a lie. They are in the conservation of business. Take their breeding programmes. Even when zoos do breed successfully it is not with the aim of reintroducing animals to their natural habitat. Their interest is in ensuring they have a captive population . . . and when that captive population gets too large they put their animals on the pill to control numbers. I think it is now time to take a leap forward. If zoos are really being honest with the public about their motives, why are 75 per cent of the animals they keep not even endangered? So what’s the answer? Obviously we can’t change the mentality of ‘zoo-ocracies’ overnight. Like any bureaucracy, they do not desire change or see a way forward. We must find a new path. I suggest that over the next 20 years we phase out the keeping of species that are not endangered or rare. That would free up more space for the species that need our protection. The real fight for species’ survival will be won or lost in the wild. But how much do zoos contribute to projects that protect natural habitat, tackle endemic poaching and reintroduce animals back into the wild? THEY say they contribute but since they don’t have to publish figures, there is no way for us to know. I believe there must be absolute transparency on this issue. And I also think any institution that keeps animals in captivity should be taxed a levy of approximately ten to 15 per cent for reinvestment in in-situ projects. And any new enclosures where substantial amounts of money are to be invested must be analysed properly by a regulatory body to prove that the designs are for the benefit of the animals and not the public. At Howletts and Port Lympne we have animals that can’t breed any more, that aren’t endangered and our enclosures can’t ever be big enough. But we’re brave enough to admit those failings. Zoos must be honest enough to do the same. Change can only be led by us as individuals. I understand why many of you might be thinking of taking your children to just such a place today. There’s a certain nostalgia – many of us were taken by our parents or grandparents – and a misguided belief that zoos are a respectable form of entertainment. But the truth is they’re not. Just look into the eyes of a caged tiger and tell me otherwise. I agree entirely with Damien Aspinall. The recent decision to not allow elephants in zoos should be the first step in phasing out zoos completely. The decision by countries world wide to not allow animals in circus acts should be implemented immediately. When the fences were washed away in 2011 at Tiger Canyons, I was forced to bring Corbett into a boma 200m by 200m. The alternative was to leave him to be killed by Seatao. However, Corbett was wild born and wild raised and then confined to captivity. The decision haunts me daily. By December 2013, Corbett will gain his freedom once again, as the expansion of Tiger Canyons is complete. I am counting down the days to freedom. The South African government released two important and shocking news items last week. The first announcement revealed that 461 rhinos had been poached in the country to date as of July 3—more than were killed in all of 2011. Poachers target the animals for their horns, which are valued in China and Vietnam for their purported (but nonexistent) medicinal qualities. The second announcement was a proposal for the legalization of rhino-horn trade, which is currently illegal under the Convention on International Trade in Endangered Species (CITES). The announcements came from Edna Molewa, South Africa’s Minister of Water and Environmental Affairs, who said she will formally make the proposal at the 2016 meeting of CITES delegates (known as the Convention of the Parties or COP), which will take place in South Africa that year. Molewa praised her country’s efforts to conserve rhinos—a true success story, as both African species were nearly wiped out a few decades ago—while saying that this success has also made the animals targets for criminal gangs. “South Africa cannot continue to be held hostage by the syndicates slaughtering our rhinos,” she said in a prepared statement to the media, adding that a “well-regulated trade system” would help all future conservation efforts. South Africa reportedly will not seek a full legalization of all rhino-horn trade but a one-time sale of current stockpiles. The South African government has stockpiled more than 16,400 kilograms of rhino horns—mostly confiscated from poachers—while private owners possess about 2,000 kilograms more—ironically, mostly horns that have been removed from live animals to make them less attractive to poachers. With rhino horns fetching anywhere from $10,000 to $40,000 a kilogram, the South African government could net half a billion dollars or more from the proposed sale. Private ranchers, who own much of South Africa’s rhino population, would also benefit from this windfall. In fact, many ranchers have been pushing for a sale like this. South Africa’s deputy director general for biodiversity, Fundisile Mketeni, said monies from the one-off sale “should go to conservation”—note that he didn’t say it would—but experts and conservation organizations say the sale would do little more than feed the growing desire for rhino horns and make the situation much, much worse in the long run. History backs them up on this point. Similar one-off sales of ivory to Japan in 1999 and China in 2008 have been linked to the resultant increased demand for ivory in Asia, which has driven elephant poaching across Africa to crisis proportions in the past decade. At the time, proponents of those sales said flooding the market with stockpiled ivory would lower prices and therefore eliminate the incentive to poach more elephants. The opposite happened and prices soared. South Africa now argues that putting more than 18,000 kilograms of rhino horn up for sale would glut the market, lower prices and save more rhinos. This is an argument we have heard before. And while South Africa may be home to 73 percent of the world’s rhinos, will consumers care if their rhino horn powder is sustainably sourced, which species it comes from or if it originates from South Africa? Poachers don’t care: they’ll target the animals that are easiest to kill and yield the biggest profits, so they’ll take whatever animals they can get. A renewed rhino-horn trade could increase the threats against the Sumatran rhino, which now numbers fewer than 275 animals, or the Javan rhino, which has fewer than 50 surviving members of its species. Those species can’t handle any increase in poaching levels. So, would legalizing rhino horn trade put an end to poaching? I doubt it. Putting a “well-regulated trade system” in place would probably take years and high levels of international cooperation. Meanwhile the criminal mechanisms already exist to poach and smuggle rhino horn and it seems highly doubtful that they would transition to a legal system; instead, they would continue to kill and smuggle through existing channels while the news that rhino horns were about to become legal served to increase their market. South Africa is obviously desperate to protect its rhinos. Poaching hurts not just animals but people, and dozens of guards and rangers have been murdered protecting the rhinos in their charge. Guarding and protecting every rhino is next to impossible, as most live in gigantic national parks or wide-ranging reserves. Corruption exists at every level, from guards and police who take bribes from poachers to veterinarians who provide the drugs used to take down rhinos. Legalizing rhino horn, however, does not appear to be the answer. Instead, the international community needs to target the consumer demand for rhino horn and end it. Rhino horns are useless to every human but they are essential for rhinos, which use them to defend themselves and root up food. Eliminating the market for rhino horns is the only way we’re going to ensure the long-term survival of these threatened species. One last note: in the eight days after the legalization announcement an additional 19 rhinos were killed in South Africa, bringing this year’s total to 480. Only 140 people have been arrested for the crimes so far this year. People have phoned me congratulating me on the South African Government's decision to open the trade in rhino horn. I don't see it as a cause for celebration. The fact that the rhino has to pay its way into the future via the trade of its horn, is an indictment against the human species. The trade in rhino horn is in my opinion, the best of several bad options and I congratulate the South African Government on their bold decision. However, I query the fact that the Government must wait until 2016 to implement. Surely a special meeting of CITES can be called. This is a major crisis and South Africa has 95% of the rhinos. 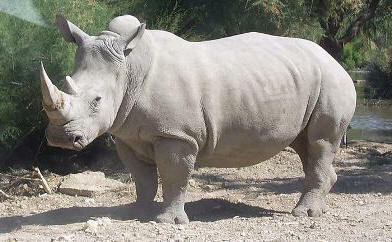 By 2016, several thousand rhinos could be dead at the present rate of poaching. The article makes several valid points. What will be the effect on the last of the Javan and Sumatran rhino? We don't know! What we do know is the present situation is catastrophic and we have to change. The onus is now on every one of us rhino owners who are in possession of rhino horn to support the SA Government by trading responsibly through controlled auctions. I challenge the private enterprise to make the considerable investment in rhino horn cloning and turn it into a billion dollar profitable business and then plough the funds back into conservation and by extension, protection of the rhino. I read your newsletters since I have visited you and your project in 2008. Most of them are quite interesting. I do not always have the same opinion as you but this time I think I have to reply for the first time. Of course there are always at least to sides of every story and the attitude towards zoos can differ. There are several pros and cons and every one has to balance them and take his own decision. However, some statements are not correct from my point of view. I do not know Damian Aspinall but how can you compare to see a real animal with watching a film? Do you have no plants in your house just because it is so easy to get the most beautiful pictures of flowers? Can such a picture substitute the plant in your house? Do you have no garden but a video-installation with changing pictures of the jungle? Do you tell your children not to go out and play football but rather watch TV because the professional players can do much better and can be seen from any perspective? Do you live in front of a computer because google has it all instead of going out? Probably not. I am quite sure that reality cannot be substituted by digital media. Yes, they can intensify our senses but without reality we will never feel a real passion for nature and in turn will not protect it. I do go to zoos with my two year old twins and they love it. I let them interact with pets. I let them ride on a horse (if you can call it that way with two years). I do hardly never show them films, however. And I know that animals will play a role in their live when they are grown ups. That is important to educate them in a way that they will protect our nature one day. It is not correct that zoos play a minor role in conservation. The entrance fees you state that could be used for other purposes would not be available without zoos. So your idea doesn't lead anywhere. Think of the Frankfurt zoological society and call in mind that Serengeti would probably not exist any more without Frankfurt zoo. This is only one of the uncountable projects that are not only supported but carried by zoos. Of course there are bad zoos and yes, especially the leopards have not the best enclosures in most zoos. Tigers and lions are much more relevant for the visitors and therefore they can get the more expensive enclosures. Zoos do a lot against zoochosis and I wonder quite often how animals would choose if they could. A life in free nature, in a zoo, as a pet. What is best? Compared with humans probably most think that roaming free is best. But this is only the romantic idea we have of it. How many people realy chose such a life? Most individuals chose the burgois annoying life with a retirement arrangement. And that it why I am not sure if sometimes the life in a zoo - even if it is not the life the animals were designed for - is the preferable one. Humans also changed their lifes in a way that has not much to do with what they were designed for from evolutionary aspects. · How many Zoo’s worldwide have closed down over the last 10 years? · How do you connect ordinary people with wild animals who will never visit a park with the wild? TV is not the answer, its surreal. · A think a case can be made for a bit of ‘reverse psychology’ when one visits a zoo one could become intensely aware of the ‘suffering’, it stimulates a conservation consciousness, an interest to visit a park when you can, a commitment to take up the cause. · Zoo’s also facilitate green areas. If they are closed hopefully a park will replace.